Hey there, I'm in this to do beautiful work that will stand the test of time. Ever since I learned that I learned that Mix/Mastering was a job I knew it was right for me. I like taking great songs and making them sound great, so that wide audiences can find new artists exciting. -Trained with Micheal White, a mixing engineer with 30 years of experience, a master who's worked with Whitney Houston, Mick Jaeger, and hundreds of other professional artists. -Read extensively on mixing, some of the books I've studied: "The Art of Mixing" by David Gibson, "The Mixing Engineer's Handbook" by Bobby Owsinki, and many others. -Keep up with the latest software; I mix on Pro Tools & Ableton, I have the Waves Mercury Bundle, Izotope 7, Steven Slate Rack, Fabfilter Pack, etc. I have the right tools for the job. -I've been producing and mixing for several years. I am just beginning to get into the professional scene. I'm dedicated to doing the best work I can. This is my art and I take that seriously. Because I don't have the extensive resume that some of my mentor's have, I'm also doing all this work for a very competitive price. If you're a start-up artist looking for pro-quality work, I can do some great things with your track. Let me know if you have any questions. A: Perspective. I know many artists and I've heard eerily similar descriptions from them about their own work. Once they work on a track long enough, put their heart and soul into it, they lose perspective on what it sounds like to an outside listener. I have the fresh ears needed to translate the artists vision to a listener's expectations. A: I work in box on a custom PC. Some studios flout fancy gear as if gear magically makes music sound better. I know that I have all the tools digitally that every older studio has had access to and I know how to use those tools. It's not about gear, it's about knowledge. A: My greatest inspirations are my mixing teachers; Micheal White, Dave Pensado, and Graham Cochrane. They're all amazing. A: Full track mixing. 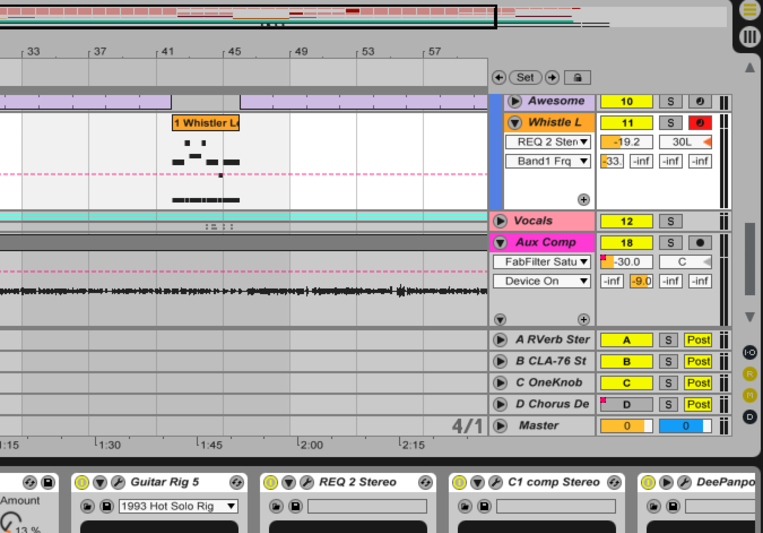 I receive stems via email and I put them together to make an awesome song.